October 16 is World Food Day. This year, the United Nations has chosen the theme “Climate is changing. Food and agriculture must too” for this annual initiative. 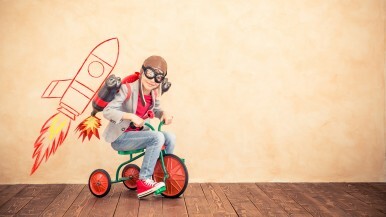 The demands placed on technology used to manufacture and transport food are also changing. The Bosch Group sees a wide range of opportunities in this area, and through innovative solutions, it is already helping to ensure that food is produced, packaged, and transported sustainably − from field to plate. 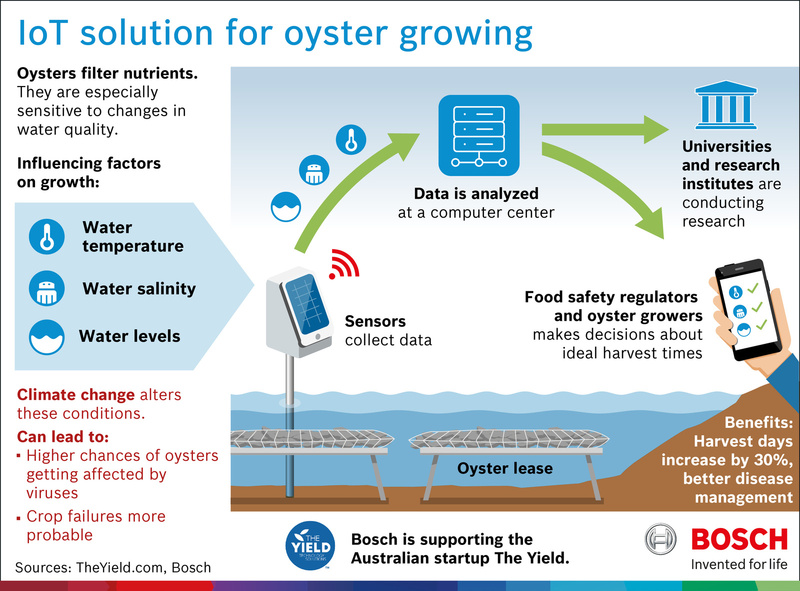 In Australia, the partnership between Bosch and the start-up The Yield is demonstrating that connected solutions can be used successfully in aquacul-ture. 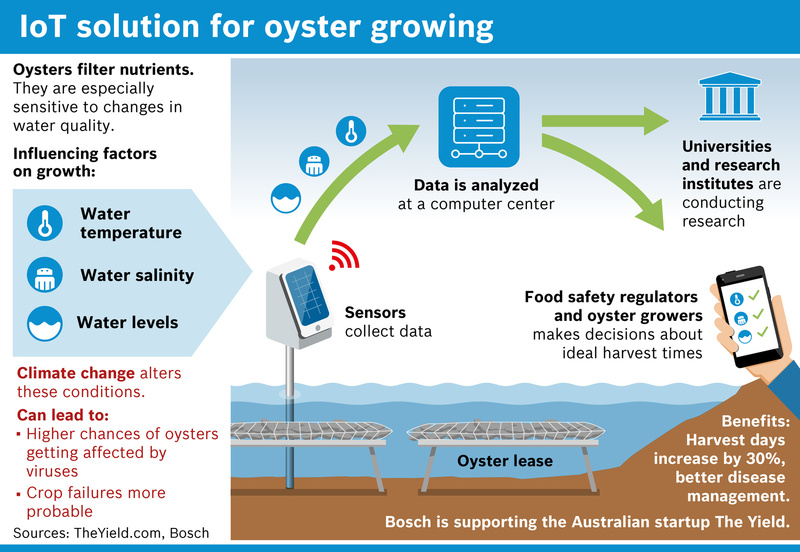 State-of-the-art sensors precisely determine the parameters that are key for harvesting oysters, such as water temperature, salinity, and water depth. Software is used to collect the data, which is analyzed by algorithms and then sent directly to the farmer’s smartphone. Based on this data, the farmer is able to harvest at the right time. Oysters are affected in several ways by the impacts of climate change. If the ocean temperature rises, it alters their biorhythm, while a change in salinity corrodes the animals’ shells. Both weaken the oyster, which, as a filter feeder, contributes to water quality. 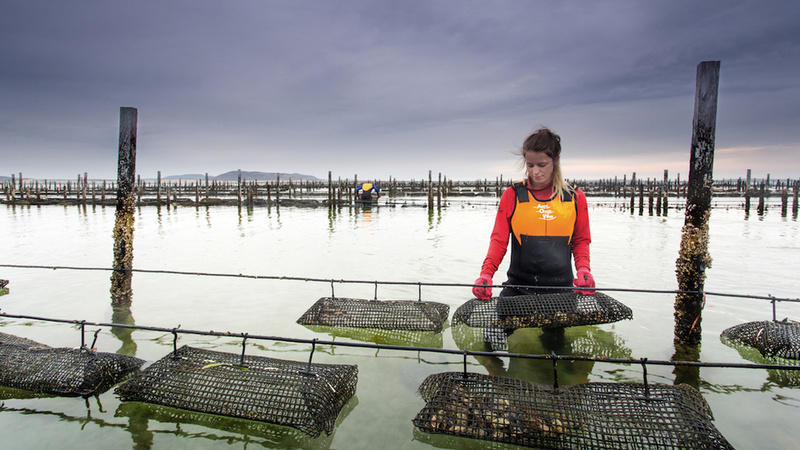 Oysters ingest water and filter out pollutants, improving water quality in the process. If oysters ingest too many pollutants, or if temperature and salinity change, there is a risk that they will contract Pacific Oyster Mortality Syndrome (POMS) − a possible consequence of climate change. The Yield ensures that farmers are immediately notified of any change that can lead to POMS. Doing so makes it possible to re-duce bad harvests by up to 30 percent. “Our objective is to feed the world without ruining the entire planet,” said Ros Harvey, founder and managing director of The Yield. In addition to software- and hardware parts, Bosch also provides the computing center for collecting and recording the data. 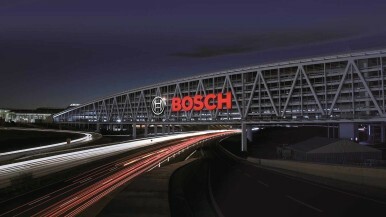 As a shareholder, the Bosch Group has so far invested more than two million euros in The Yield. 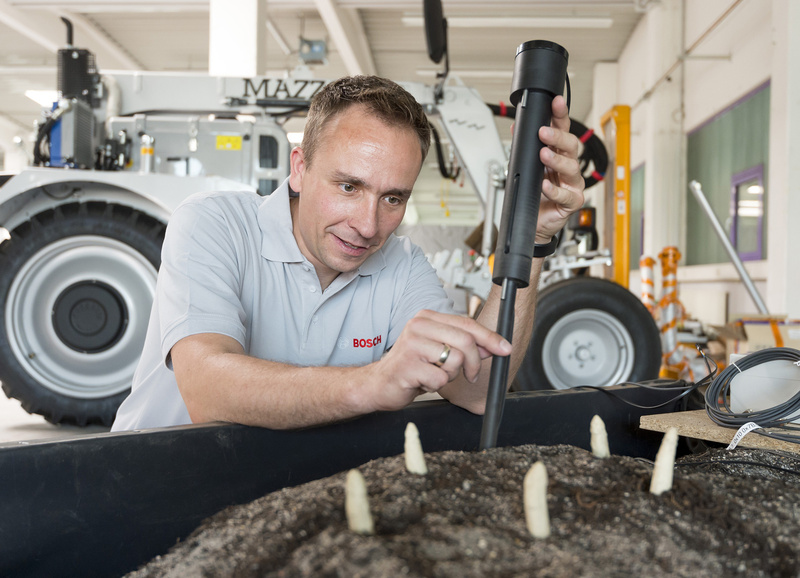 Bosch is improving commercial asparagus yields with connected radio sensors. Asparagus grows especially well between 18 and 22 degrees Celsius. One way growers maintain this temperature is by covering the mounds in which the asparagus grow with strips of two-sided foil: one side is black, the other white. To heat the soil with the help of sunlight, the foil is laid with the black side facing up. To cool the soil when it gets too warm, the foil is laid with the white side facing up. 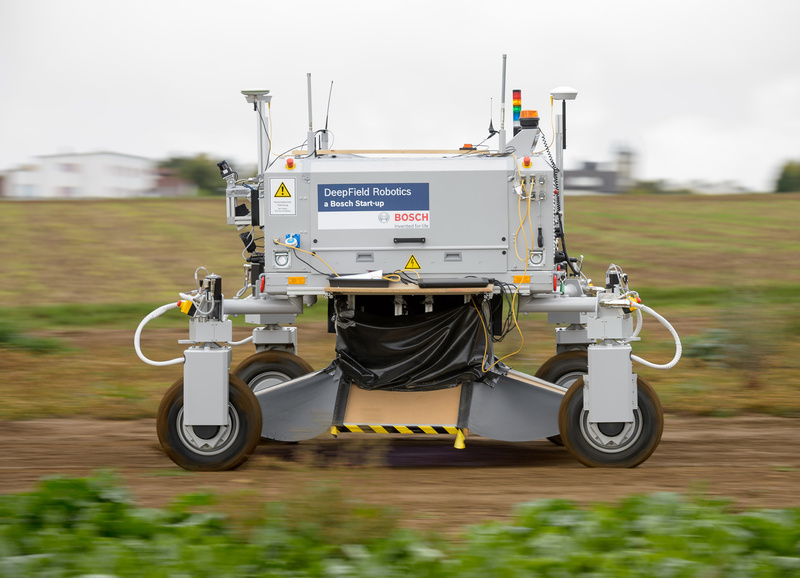 The solution of the Bosch start-up Deepfield Robotics consists of several temperature sensors. They are placed into the soil at different depths and record the temperature. Cables transmit the temperature readings to a small box, which itself transmits the data via radio to the Bosch IoT Cloud. From there, the data is routed to an app on the grower’s smartphone. 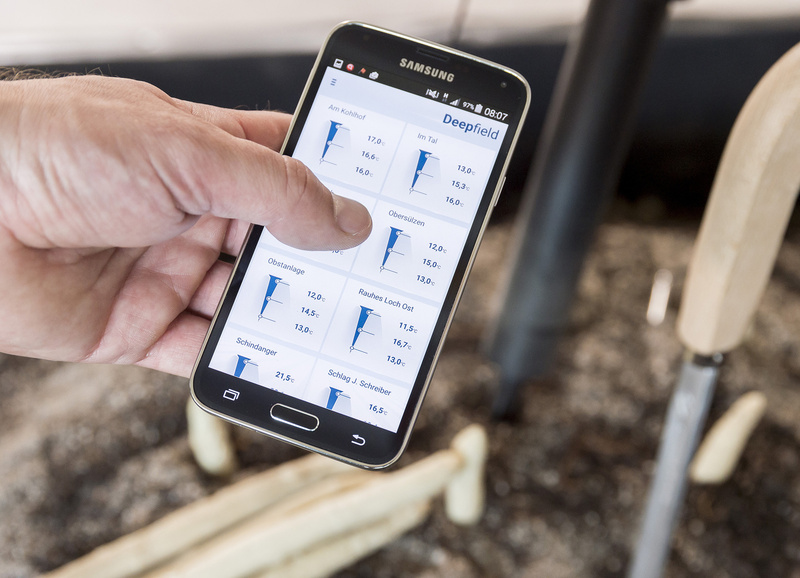 Growers can use this data to track the temperature changes in the growing mounds at all times, which means they can act quickly to optimize the growing conditions for the asparagus. “The food industry is full of untapped opportunities,” says Amos Albert, the director of Deepfield Robotics. 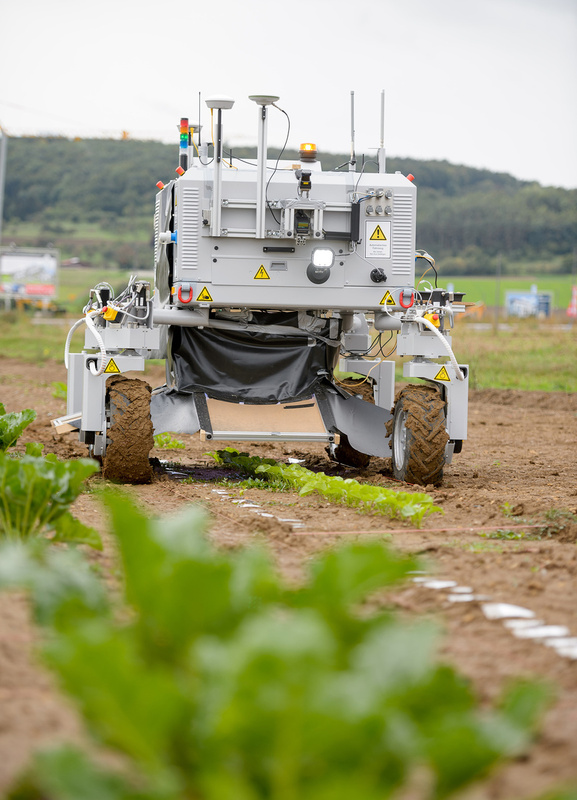 The Bonirob agricultural robot replaces the work − normally performed manually − of separating out seeds with genetically undesirable traits, thereby reducing the percentage of crop failure. Thanks to automatic image processing and satellite control, users are able to guide Bonirob across the field during outdoor use with accuracy down to the nearest centimeter. Instead of pesticides, Bonirob eradicates weeds manually, simply ramming them into the ground using a special device. At the end of this year, Bosch in India will be presenting additional IoT solutions for more efficiently designing agricultural processes. Here, too, plants are monitored by Bosch sensor technology. The Sankhya system gathers and analyzes data in order to process it for use at a later date. The AquaZen system is able to irrigate plants as needed. A new process makes it possible to package dry products, such as sugar, grain, flour, and powders, in dust-tight packaging that uses a sustainable monomaterial paper instead of a polymer film. Bosch Packaging Technology partnered with BillerudKorsnäs to develop the world’s first sealed paper packaging. Retailers and consumers benefit from clean shelves, a high degree of product protection, and consequently better product quality. The Swedish paper specialist BillerudKorsnäs contributed its expertise to the optimization of the paper’s mechanical properties, while Bosch Packaging Technology lent its know-how as a leading supplier of packaging technology. The result is a tear-resistant and recyclable mono-material paper sourced from sustainable forestry. Bosch engineers developed the world’s first vertical form, fill, and seal machine (VFFS) that is capable of sealing paper. “Together, we have developed a solution that will change the packaging market,” said Joachim Dittrich, who heads the Liquid Food business unit at Bosch Packaging Technology. The packaging machine turns the paper into tear-resistant and, above all, dust-tight paper packaging with a dual benefit: no food waste and minimal environmental impact. Bosch is also revolutionizing food packaging in South Africa. The technology company’s aseptic filling technology is now being used at the food producer RCL Food for the popular beverage known as mageu, which is a kind of maize extract. As a result, the beverage is shelf-stable for up to a year even without refrigeration, and Bosch is making a crucial contribution to food safety through hygienic filling and packaging. How are the bananas doing in the container? Thanks to modern logistics, consumers in Germany can purchase bananas year round. But the bunches that make it to German supermarkets are only a portion of those originally loaded onto the container ships. As a rule, just under one-third of the popular fruit fails to withstand the approximately two-week sea voyage from South America to Europe. Now that Bosch has already designed “smart” processes in many industries, the logistics and transport sector is also becoming increasingly connected. With Bosch solutions, it will be possible to make transporting goods significantly more agile and efficient in the future. An initiative by the German Federal Ministry of Education and Research (BMBF) is laying the foundation for this. The publicly funded “smart container” project aims to connect cargo containers and ensure smart monitoring of their contents. In cooperation with the food producer Dole, the consortium consisting of 22 partners has equipped three containers on a cargo ship with wireless sensors that monitor the fruit around the clock. The software technology comes from Bosch Software Innovations. The freight supervision unit (FSU) was developed specifically for cargo shipping. It acts as a digital bridge between the container’s interior and external recipients at Dole. If the temperature inside the container falls below 11 degrees Celsius, the unit linked with it at Dole triggers an alarm, enabling the customer to take necessary steps. This method results in nearly 10 percent more fruit per load that survives the journey. In connection with this, Bosch is now thinking about an independent follow-up project that covers all steps of the process, from loading the container to the delivery of the goods at supermarkets. Bosch therefore aims to further establish itself as a “Logistics 4.0” service provider for the internet of things. The sustainable and careful use of valuable resources has become an important issue for many consumers. This is especially true when it comes to food. However, busy schedules do not always make it easy for families to keep track of what they have in the refrigerator. As a result, some items are left untouched, some are purchased twice, while others spoil and have to be thrown out. Modern technology can make a valuable contribution to avoiding food waste. For example, clearly arranged interiors and optimum lighting are now a common design feature of modern Bosch refrigerators. If everything has a place, and if it is possible to customize how the existing space is organized, then it is easier for consumers to see the items and amounts they already have. Lighting from above and the side helps people to keep better track of all items on hand and see whether they are close to or already past their sell-by dates. Climate-controlled drawers keep sensitive food items fresher considerably longer. The “smart” refrigerators made by Bosch go one step further. For example, the Home Connect “Camera in the Fridge” device makes it possible for the first time to see what is already in the refrigerator without opening the appliance’s door. The built-in cameras take a picture of the items inside the refrigerator each time the door is shut. This means that no matter where someone might be, a quick look at the smartphone app will always show the most up-to-date status. Consumers are therefore able to purchase what they actually need, each and every time, which makes sense not only environmentally, but economically as well. Sustainability in the food industry does not end with the use of modern technologies. Bosch is also actively involved in social projects. In China’s Ningxia Hui region, Bosch is supporting the expansion of school cafeterias. In the regional capital of Yinchuan, the Bosch China Charity Center (BCCC) recently renovated the Shengli school, built a proper cafeteria for the children, and invested in sports facilities and classrooms. The objective is to ensure a balanced diet for the pupils. The BCCC covers the cost of three of the five lunches during the week, while the children’s families pay for two meals.